The big ugly broken terracotta pot just outside my office that looked so stunning with the spring flowering Ixias I wrote about a while back (and also showed off here) was looking very sad now that the Ixias are finished for the year. I’ve been patiently waiting for them to die down as I want to save the bulbs for next year, but I also wanted to do something with the pot. I’ve had the idea to make this a “seasonal pot”, i.e. to change it every three months with seasonal annuals or bulbs. So today I cleaned up the remains of the Ixias, added lots of new compost to the pot and looked around for something to plant in it. It gets pretty hot where the pot stands and gets a good few hours of direct and bright sunlight, so the new Gerbera daisies I bought last week seemed an obvious choice. I thought they would look pretty boring planted all on their own when I remembered the Dusty Miller seedlings I nurtured from seed. Yes, they were ready to get planted out and a few Carex “frosted curls” could look good with those two … so I planted them all together. A few weeks and we should have a fairly nice display going on. In other news … I finally got my act together and tied the Mandevillas up onto the triangular teepee thingy I’ve had for months. Looks pretty. Other than that, I’ve been shunting around and laying compost and mulch, transplanting plants that were not thriving to new positions, pruning, cutting back, tidying etc. … doing my final preparations for summer which officially starts on Thursday, here in sunny South Africa. What have you been doing in your garden? I love the combination! I really like the Carex with it, and the daisies are such a pretty color! 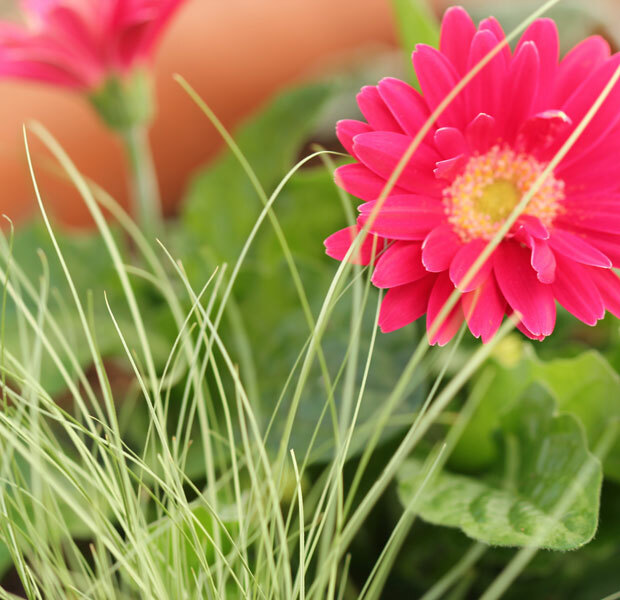 Your Gerbera daisies look so vibrant and full of color, and I like them with the Carex too. I’ve always loved those flowers, but so often here I mostly see them in cut flower arrangements, and they get all floppy after just a day. I expect they perform much better in the garden, although I admit I’ve never grown them. You are having more fun than me – I am hacking and chopping back what has become a sleeping beauty wilderness – really hope we don’t find some rip van winkle in the bramble patch. Your combo is very striking! 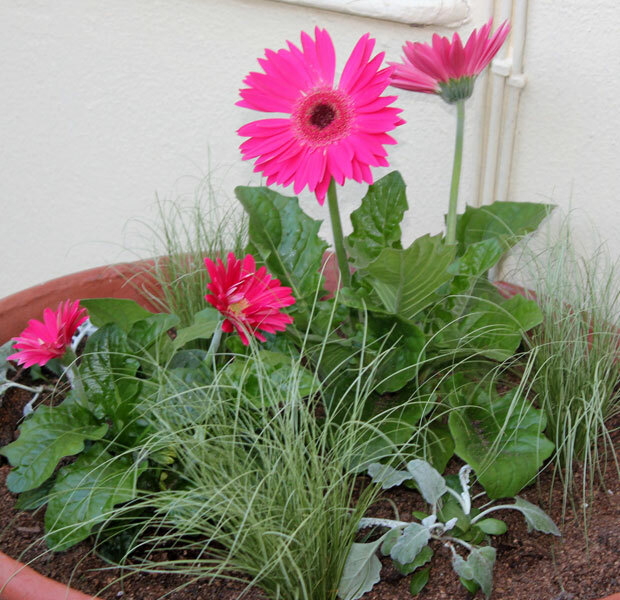 Gerbera daisies are a great choice. With care, they can last for years. In my climate they may die back to the roots and come back in spring. This fall, I potted up four to bloom in the greenhouse. The trick for longevity is to keep soil from covering the crowns. Thanks for the advice Nell Jean!! I’ll be sure to keep the crowns free. I love how bright and cheerful the Gerberas are and I’m loving looking at them from my office – would like to keep these going for as long as possible. I think the pot will look great once they grow a bit! Hello Christine – Since it is the beginning of your summer and the beginning of our winter, I will plan to spend time with your Gardening Blog during the next few months. I’m looking forward to it! Gerbera Daisy is one of my favorite annuals. I sometimes overwinter them because I like them so much. Your combo is nifty with that hot pink. They come in the brightest colors which makes for a happy pot of plants. I’ve never had them before – I couldn’t resist when I saw them at the nursery. I’ll have to look out for more colours. I like the foliage too. I like that combination. That hot pink will look good with silvery leaves. 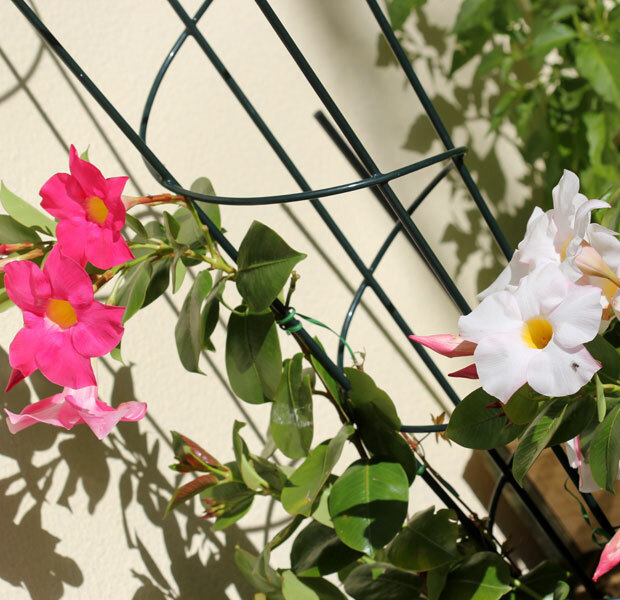 And, you won’t believe it, but my mandevilla put out its first bloom yesterday! Poor thing! We’re expecting our first freeze in a day or two! I’ve been doing pretty much the same as you, in between days of rain. Mulching, moving, pruning, weeding, tidying, getting ready for the hot, dry weather to hit. The pot should be a winner! Happy summer! The gerber daisy combination is really pretty! Here, the fall colors are fading fast, and rains are bringing down most of the remaining leaves. We could get snow this week! All are beautiful! Gerberas are a personal favorite–I can’t do anything but smile when I see them. And I loved your previous post on Ixias! Gorgeous!